Darmowa noc w dowolnym Sheratonie! Żeby ją otrzymać, należy spędzić pięć (niekoniecznie kolejnych) nocy w dowolnych hotelach Sheraton do 30 września 2015 r. Maksymalnie można otrzymać 3 darmowe noce. Wcześniej należy się jeszcze zarejestrować na stronie promocji. Można to zrobić najpóźniej 15 września. Otrzymany certyfikat na darmową noc ważny jest do 13 grudnia 2015 r. Można go wymienić na noc w piątek, sobotę lub niedzielę w dowolnym Sheratonie na całym świecie, nawet w najwyższej, 7. Kategorii. Żadne daty nie są wyłączone z promocji, no chyba że ogólnie hotel (standardowe pokoje) jest na dany dzień wyprzedany. Eligible member must register by September 15, 2015, 11:59 p.m. EDT. Members can earn one (1) Sheraton® Free Weekend Night Award to be used at participating Sheraton hotels on a weekend night after they book and complete five (5) eligible nights at participating Sheraton hotels between July 9 and September 30, 2015 (the "promotion period"). Members can earn this Award up to three (3) times for up to three (3) Sheraton Free Weekend Night Awards. This promotion is not transferable. Bookings made prior to the promotion period are eligible, but only eligible stays consumed during the promotion period will earn the promotional Award. Sheraton Free Weekend Night Awards will be credited to the member's account within 2–4 weeks of the eligible stay posting to the member's Starwood Preferred Guest account. Sheraton Free Weekend Night Awards can be redeemed for any participating Sheraton Category 1–7 hotel for a standard room for any weekend night (Friday, Saturday, Sunday except in the Middle East, where it is Thursday, Friday, Saturday). 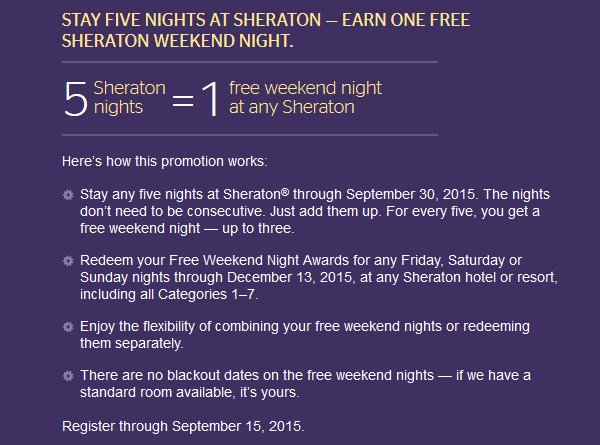 Sheraton Free Weekend Night Awards must be redeemed for stays consumed by December 13, 2015. Members should call SPG customer service and mention Award ID F1WFN to redeem. Awards are not transferable and may not be redeemed for cash or Starpoints. Unused Awards will be forfeited. Sheraton Free Weekend Night Award stay(s) and night(s) will count toward elite earning qualification. Sheraton Free Weekend Night Award(s) are combinable and may be added to existing paid or Award stays. All promotions are subject to the Starwood Preferred Guest program terms and conditions, which are subject to change without notice and can be found at spg.com. Offer is applicable to individual members only and not to groups. Not responsible for omissions or typographical errors. Starwood reserves the right to discontinue this offer at any time. To update your communication preferences or learn about our privacy practices, view our Privacy Statement on spg.com/privacy, or access our privacy information line by calling 1-877-782-0071 in the U.S. and Canada or +353-21-4930474 in all other countries. Starpoints, SPG, Preferred Guest, Sheraton, Westin, St. Regis, The Luxury Collection, W, Le Méridien, Tribute Portfolio, Element, Aloft, Four Points and their respective logos are the trademarks of Starwood Hotels & Resorts Worldwide, Inc., or its affiliates. Void where prohibited by law. To kto znalazł Sheratona za stówkę? jak nie szalona sroda, to "super promocja". ogarnij sie czlowieku. dla mnie ten blog sie skonczyl.